Bedford Pet-Friendly Studio Apartment There's no place like home, especially when you call 935M Apartments home. Our pet-friendly luxury studio apartments have everything needed to settle in for a cozy movie marathon or go out on the town. Located in Midtown Atlanta, 935M Apartments have all the features you're looking for in a studio. 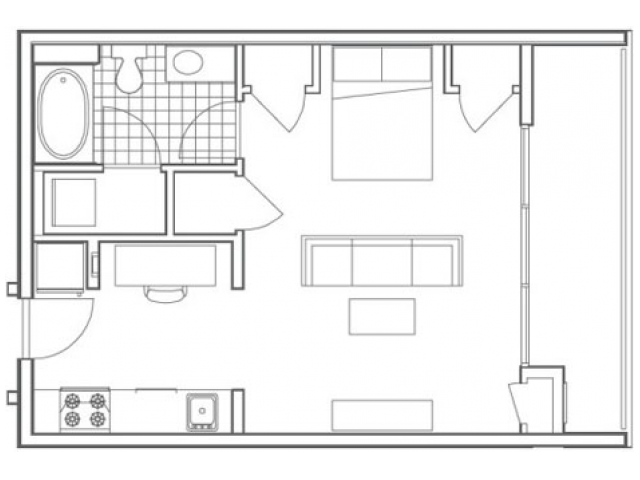 The simple, yet elegant design of our Bedrock floor plan includes appliances, a breakfast nook, a living and bedroom, three closets and a bathroom with soaking tub, all in 600 square feet. Luxury Amenities We love animals at 935M Apartments, so our Bedford unit is pet friendly up to two pets. As a tenant, enjoy amenities such as a resort-style pool, fitness center, lounge area, conference room and more. You also get 24-Hour emergency maintenance for any issues you may encounter. Imagine all of this in your next studio apartment paired with a beautiful view of the Atlanta skyline. Midtown Hotspot The Bedford space is especially convenient for Georgia Tech students and faculty. Midtown is known for great restaurants, clubs and bars. For a little culture by day, enjoy The High Museum of Art or nearby Piedmont Park. 935M Apartments is close to I-85 and Northside Dr, so nothing in Atlanta will be far from home. Apply or See it Today If you're looking for a studio apartment to rent, call 935M Apartments today to take a tour of our luxury apartments. Our Bedford unit is available through our easy tenant access portal. Pay rent, request maintenance and apply for a studio all in one place. Email , apply today or call (866) 991-5178 learn more about the Bedford luxury studio apartments.